In January, an event was held in NoHo called Tribal Dance Jam. Basically, a bunch of FatChanceBellyDance format dancers gather together, and, just as musicians like to do when they get together, jam. Since American Tribal Style is group improvisation, everyone who knows the vocabulary can dance together. I knew it would be fun partly because lots of my friends would be there, but also because it was a belly dance gathering without performances. It's very rare that I get to go to shows without being part of the line-up, and because of this, I often leave Alice at home with the spousal unit since I can't care for/watch/save her from doing things detrimental to her health while I'm getting ready or performing. I knew this would be the perfect thing for Alice, and I was not wrong. Held at Remo Drums, it was in the back in a huge auditorium with the fabulous drummers of Twisted Gypsy on a platform leading the music. The place was packed with women in cholis and 25 yard skirts, hair up with flower adornment. Alice and I paid and she was sure she was in a sea of Mommies. No sooner were we in the door, and she was hugging women who knew me, knew OF her, but whom she'd never met herself! It was a wonderland of color, movement, and rhythm, and Alice could not have been more delighted. I knew that Alice, being two, and, well, being Alice, would not sit demurely in the corner, so I had already anticipated not getting to dance myself. She was so excited and I'm fairly certain I burned a thousand calories that day chasing her around. However, she didn't really dance much, like I expected. Rather, she made her home with the drummers, and thankfully most of them thought she was really cute, so let her bang on their drums. Several commented that she had excellent rhythm (which she actually does!). I'm not really sure why I didn't anticipate this. 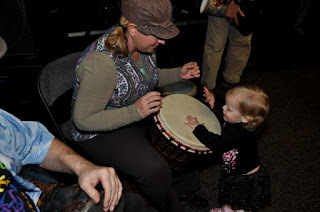 Drew keeps his doumbeks out and accessible, and she regularly plays them, either with her hands, or by finding to objects to use as drumsticks. I'm so pleased that Alice had fun, because I really want to raise her in an environment in which art is practiced, women are empowered, and community is celebrated. This is definitely the case more often than not in the greater belly dance community, which is one of the reasons I love it so. 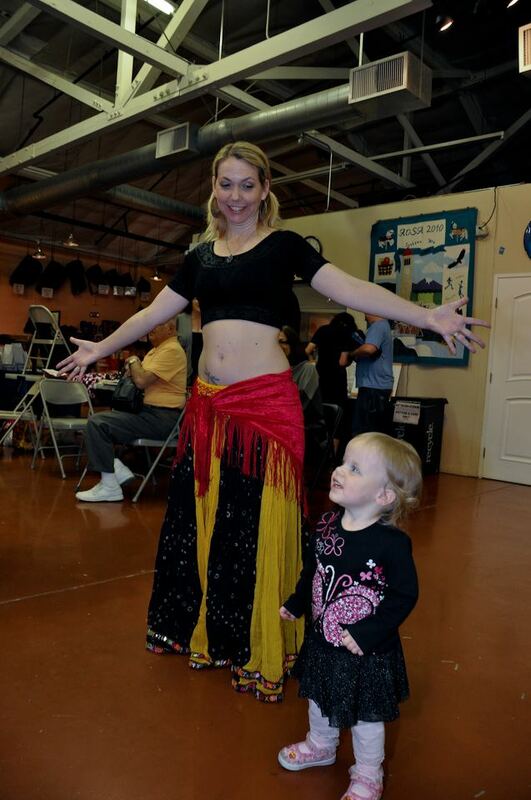 And particularly the tribal belly dance community honors the strength of women. My daughter is going to grow up being a part of a tribe that spans the earth, a tribe that will be familiar to her even when she's never actually met members, a tribe that loves and welcomes her, and of whom many helped make her mine.